Founded and compiled by the German art dealer S. (Siegfied) Bing (1838-1905) Artistic Japan was published simultaneously in English, German [Japanischer Formenschatz] and French [Le Japon Artistique]. Bing’s declared aim in producing the journal was to “stimuler l’intérêt des amateurs” and “exercer une influence sur le goût, la culture, l’art et la constitution des collections publiques et privées” (stimulate the interest of amateurs and to influence the taste, culture, art and formation of public and private collections) in the art of Japan. One of the publication’s chief sponsors was the fashionable London retail firm Liberty & Co. who had a full-page colour advertisement for their art fabrics on the back page of every issue of the English edition. The journal contains a series of illustrated essays on architecture, engraving, Hokusai’s “Man-gwa”, the decoration of swords, Ritsuo and his School, netsukés and okimonos, the theatre in Japan, Hiroshigé, the poetic tradition in Japanese art, Animals in Japanese art, and Korin. 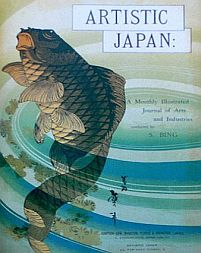 Among contributors to Artistic Japan were Edmond de Goncourt, Roger Marx, Victor Champier, and Eugène Guillaume. The editor of the English edition was Marcus B. Huish (1843-1921).